Culture Shock | Welcome to allaboutwordswa! I grew up in a small country town in Northern Victoria. 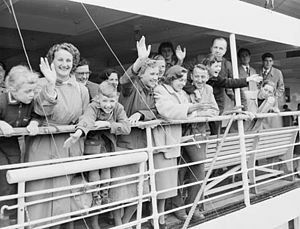 It wasn’t until the 1960’s when people of different nationalities starting arriving in town. The predominant population was from a white, Anglo-Saxon, celtic background. Due to labour shortages there was a period of expansion in migration to Australia, mostly from Europe. One of my best friends at school was first generation Australian of Italian parents. We also had a boy in class whose parents were Dutch. That was the diversity of cultures I came across in school. When I moved to Melbourne in the early 1970’s I really enjoyed the greater diversity of cultures to be found there. This mostly consisted of European migrants from Greece and Italy. Melbourne still has a very high Greek population and has the best coffee shops in Australia (in my opinion). In 1980 my husband was successful in winning a position at a remote Aboriginal Community in the Northern Territory, called Numbulwar. We had two small sons at the time. We left mid winter in Melbourne (ie very cold) to arrive in Numbulwar in the middle of their “dry season” where it was a heck of a lot warmer! Numbulwar was originally called Rose River Mission and it was established by the Anglican Church. When we went there it was being handed over to the local Aboriginal people to self manage. A lot of the traditional ways of life were still practised by the Aboriginal people, such as hunting and gathering their food supplies. There is probably a book in this story so I will try to focus on the topic of “culture shock”. There were about 500 local Aboriginal people and about fifteen white workers in total. My elder son started school while we were there and he was one of two white boys in the class. It was very much the reverse of what I had experienced before. I was in the minority, I didn’t speak or understand the local language, I found the climate really challenging, I was frightened of what I didn’t understand. The more afraid I became, the more I doubted my ability to cope in that environment. It became a negative cycle that affected our whole family. It was such a fantastic lesson for me though – to experience what it is like to be the minority and lacking the knowledge and skills to be resilient in that environment. It had a life changing impact on me in many ways. For example I now have a much greater respect for differences in language and culture. I lost any concept of superior knowledge or ability that I may have arrived with. I also have a tremendous respect for peoples’ rights to believe differently that what I do. Would you believe that in 1980 the school children were expected to assemble once a week (under the direction of the white principal) and stand up and sing “God Save the Queen” (the National Anthem at the time). I doubt that any of those children had any concept of the Queen and she would have no importance to them anyway? How can we question others’ values when some of ours’ seem so foreign and bizarre? We were only there for twelve months and moved back to Melbourne. Wow that was a culture shock as well! It was really cold, sleet and snow, busy, noisy, meaningless and strange. It was only a short time until we found another job in an Aboriginal community in the Kimberley region of Western Australia (Fitzroy Crossing) and we were off again. No culture shock this time – I was able to greet the people with warmth and respect. We enjoyed a few good years there!